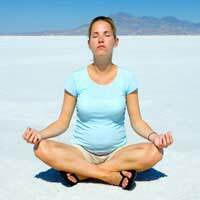 Meditating during pregnancy is said to reduce stress and make the physical symptoms easier to deal with. On the whole a calm and healthy mother is more likely to lead to the development of a healthy baby. Meditation is also seen to be very useful during childbirth when breathing is essential to a safe and comfortable labour. There are various forms of breathing exercise useful at this stage which you can learn at antenatal classes or through your midwife. You may wish to have a meditation partner during pregnancy and childbirth, preferably someone who you trust and who will have a role and interest in the development of your child. Whilst meditation is central to a good pregnancy, reducing the chances of miscarriage, early labour and contributing to the steady development of the unborn child - it is important to not overdo it! Complex Yogic positions are not all suitable in later pregnancy.A vast array of meditation techniques described on this site can however be practised when pregnant providing you are positioned comfortably, and any good Yoga teacher will advise you safely at that point. The aid of cushions, or again, a partner can come in useful here. A simple breathing or visualisation technique is perfectly adequate for fostering a relaxed and positive mental attitude, enabling you to focus on the present and enjoy the changing stages of pregnancy as they occur. Unless you are well versed in spiritual matters it is not necessary to engage with deeply spiritual forms of meditation. During labour itself, focusing on your breathing and calming your mind will undoubtedly lead to a more comfortable childbirth enabling your body to do the work that it is naturally prepared to do. A course of meditation throughout the pregnancy and up to this point will make the calming of the mind at this point a lot easier. Fundamental to this is the realisation that relaxing is not something, like childbirth, that you forcibly do, but something that occurs as a natural progression.